Healthvit Cenvitan Women Multivitamins and Minerals maintain energy level, immunity level, metabolism and muscle function of body. Over 26 key nutrients that are important to help fill dietary gaps. 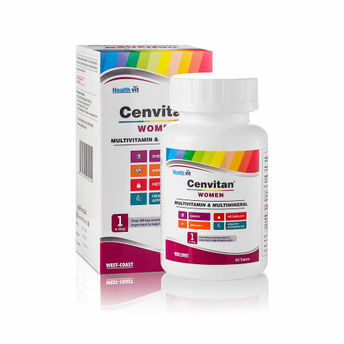 Cenvitan Women is customized for women and has nutrients to help support bone health as well as the heart, brain and eyes. It helps support energy, immunity, and metabolism. Plus, this multivitamin contains nutrients to help women maintain a healthy appearance. As women age, it becomes more important to reach the recommended daily allowance of vitamin D and calcium to help maintain bone strength.